When Six Flags Magic Mountain first opened Drop of Doom, I fell in love. I had never been on a drop ride that scared me so much as this one. The whole trip to the top of the tower is an experience everyone should have at least once in their life! Or multiple times in a row depending on line length! After having heard of the VR addition, my desire to experience Drop of Doom has increased ten fold. I feel as though the addition of the story will guide riders into a false sense of security. And before they know it, they will be plummeting to the ground! Below is all the information you need regarding this great addition to Drop of Doom! Six Flags Magic Mountain—in partnership with Warner Bros. Consumer Products, on behalf of DC Entertainment—today announced a new, extreme virtual reality experience coming to one of the world’s tallest and fastest drop tower rides. For a limited time, guests can experience the new DC SUPER HEROES Drop of Doom VR. Thrill-seekers will don special VR headsets to view the action as SUPERMAN and WONDER WOMAN battle their nemesis, LEX LUTHOR, while plunging 400 feet at speeds up to 85 mph. DC SUPER HEROES Drop of Doom VR is slated to open to the public today. High in the sky, the battle spins out of control and riders fall a thousand feet—straight down, to the city streets far, far below. 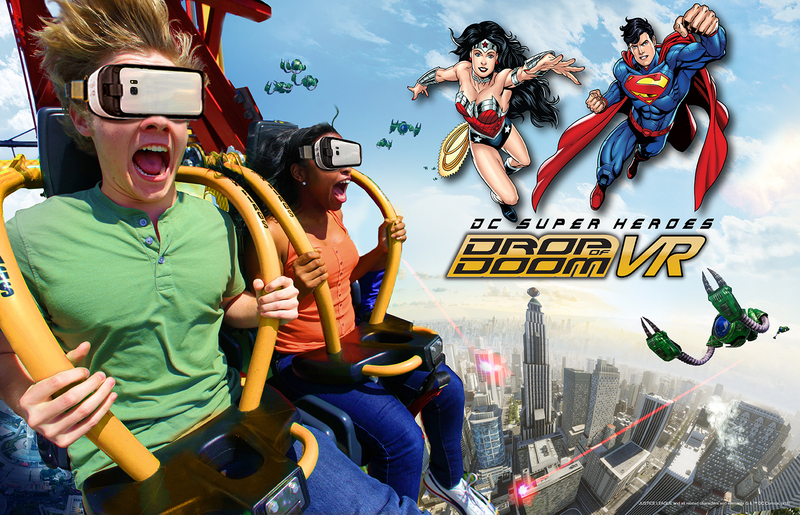 Riders must be at least 48” tall to ride DC SUPER HEROES Drop of Doom VR, and at least 13 years old to experience VR. Six Flags Magic Mountain launched their very first VR coaster experience in 2016 on The New Revolution. Six Flags Magic Mountain 2018 Season Passes and Memberships are currently on sale. Members can now enjoy priority park entry and tremendous discounts of up to 50% on nearly all food and merchandise purchases all season long. Members also receive skip-the-line passes, sneak previews, and extended ride times on some of their favorite rides and attractions. Six Flags Entertainment Corporation is the world’s largest regional theme park company with $1.3 billion in revenue and 20 parks across the United States, Mexico and Canada. For 57 years, Six Flags has entertained millions of families with world-class coasters, themed rides, thrilling water parks and unique attractions. For more information, visit www.sixflags.com.